Have you ever seen the animated lightup cereal boxes in Minority Report? That movie may be set 40 years in the future, but the Trix rabbit may start talking sooner than you think. At CES last week, Fulton Innovations showed off a new technology it’s calling “eCoupled intelligent wireless power.” The technology allows objects of all kinds to be powered wirelessly and without clunky cases and dongles. Mobile phones, a small pot, and a cereal box that lights up were some of the demonstrations we were shown at the show. Fulton is already in talks with mobile providers like LG and Samsung in hopes of embedding their technology (as small as a computer chip and very thin) into upcoming mobile phones, enabling wireless charging without any sort of case. More interesting is their plans for a wireless smart kitchen of sorts. Representatives showed off an instant soup container that could heat up its soup without the need for a pot or stove to provide the heat. It’s as simple as pulling a tab and placing the soup container on one of the wirelessly powered surfaces. The cereal box demonstration is even more interesting. 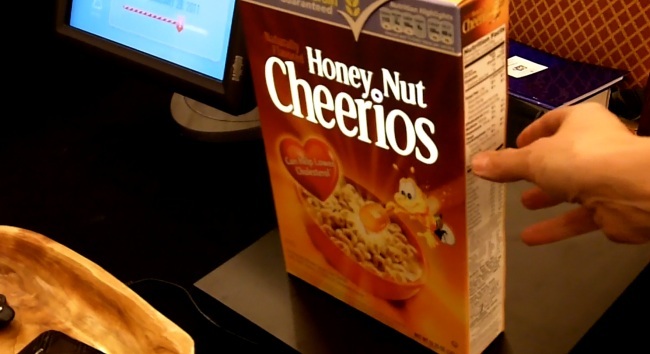 A man sticks his arm in front of our camera, but Fulton has created thin circular strips that can light up a cereal box when placed on an eCoupled surface. More useful, the cereal can actually report itself to a computer, allowing someone to know if Trix cereal is in the pantry without ever having to open it. It can also report nutrition information, quantities, expiration dates, and a host of other information. The use cases for such a technology are close to unlimited, including wirelessly charging an entire car, though we were not present for that demonstration. My only fear are inevitable messes that will be started by Grandma accidentally leaving eight soup containers on the counter. Warning: if you are still scared of that scene in Ghostbusters where the eggs cook themselves on the counter, this may not be the video for you.